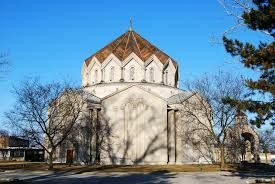 St. John’s Armenian Apostolic Orthodox Church —“The Church with the Golden Dome”— has invited us to experience their traditions, learn more about their community, and this ancient culture. First enjoy a tour of the sanctuary, accompanied by music, and the Alex and Marie Manoogian Museum. After the tour, enjoy an Armenian inspired buffet lunch. Armenian baked goods will be available for sale. This trip was very popular last year so we have decided to run it again in celebration of the church’s 85 anniversary.